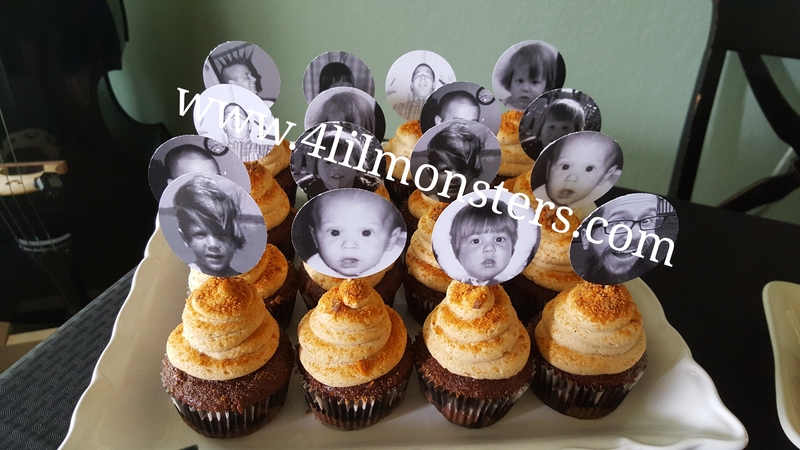 For my husband’s 40th birthday party he requested chocolate peanut butter cupcakes. I ended up making chocolate cupcakes with butterfinger pieces inside, with this peanut butter frosting, and sprinkled with butterfinger. He loved them. In an electric mixer, beat the peanut butter and butter on medium until completely smooth. Reduce speed to low and add in the remaining ingredients, beating until fully incorporated. Increase speed to medium high and beat the frosting for 1-2 minutes until light and fluffy. Once cake or cupcakes are completely cooled you can spread or pipe frosting. This batch makes enough for a dozen cupcakes. I sprinkled them with crushed Butterfinger that I ran through the food processor. About 12 mini butterfinger. Many people said the frosting tasted like Reeses peanut butter cups. One day our girls’ Guncle brought them over chocolate chip cookie dough cupcakes. They were sinful and the girls didn’t stop talking about them. So when I asked Bitty what kind of cake she wanted me to bake for her birthday dinner she knew exactly what she wanted. A blue cake, because Alice’s dress is blue, with chocolate chips in it, and chocolate chip cookie dough frosting. Hummmm, to come up with a recipe, and fast! Or worst case senerio, run to Guncle Alex’s favorite bakery if I screwed it up. So I took to pinterest. Looked at a few ideas and got to work. I was really unsure of the outcome until they got home from school and I had them and my friend’s kiddos taste test it for me. Kids are always brutally honest and that’s what I was looking for. All six kiddos LOVED it. Turns out I had enough left over that we’re going to use it for a dip at her party too. They were really excited about that idea. Beat brown sugar & butter together in mixer on medium until smooth & creamy. Add flour, vanilla extract, butter vanilla bakery emulsion, & salt into mixer until fully combined. With mixer on low, add milk 1 tbsp at a time until fully combined. Sift powdered sugar and gradually add to mixture until fully combined. Remove bowl from mixer & add mini chocolate chips. Stirring by hand until incorporated. If using for cupcakes and wanting a firmer frosting add small amounts of additional powdered sugar until desired firmness reached. I found the butter vanilla bakery emulsion at a local craft supply store. Otherwise I’d use the same amount of butter extract in its place. Can be used for a frosting or a dip to serve with cookies or pretzels. I’d keep it refrigerated until serving in either form. Surprisingly it’s not excessively sweet. It taste like chocolate chip cookie dough, minus the eggs of course. If you wanted it sweeter you could try maybe adding a 1/2 cup of regular sugar to the mix. This was more sugar than I’d typically use in any recipe so I opted to not keep adding more, especially after seeing how much the kids all liked it. 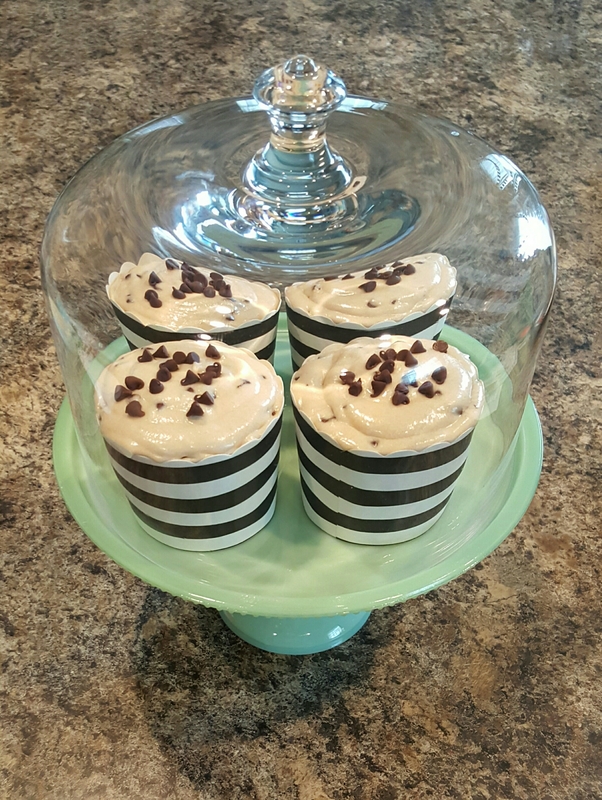 I also made some chocolate cupcakes with this frosting for her to share with her friends at dance class (though I wish I had thickened it up a bit).